There are many events happening in and around Edmonton that relate to the types of conversations that "The Writing Stick" hopes to encourage. The Book Publishers Association of Alberta and the Writers’ Guild of Alberta are pleased to present an informative talk (and book launch) addressing guidelines aimed to help writers, editors, and publishers produce material that reflects Indigenous people in an appropriate and respectful manner. Features include guidance on working in a culturally sensitive way, a discussion of problematic and preferred terminology, and suggestions for editorial guidelines. Gregory Younging, a member of the Opaskwayak Cree Nation in Northern Manitoba, has been the managing editor of Theytus Books, the first Aboriginal-owned publishing house in Canada, for over 13 years. Elements of Indigenous Style evolved from the house style guide Gregory developed at Theytus in order to ensure content was consistent and respectful. "Why Indigenous Literatures Matter: Reading (and Teaching) Beyond Wreckonciliation"
How do we learn to be human? How do we become good relatives? How do we become good ancestors? How do we learn to live together? These are questions, argues Daniel Heath Justice, that Indigenous literatures take as central—and pose to their readers as well. In grappling with these problems, Indigenous literatures (and their audiences) can challenge those settler-colonial policies and practices that have targeted Indigenous connections to land, history, family, and self—and instead nurture strong relationships into the future. This talk welcomes new audiences to Indigenous literary studies while offering more seasoned readers a renewed appreciation for these transformative literary traditions. Justice's book, Why Indigenous Literatures Matter, is newly available from Wilfrid Laurier University Press (and will be available at the event). ALSO FEATURING readings by up-and-coming Indigenous writers (and EFS graduate students) Mackenzie Ground, Brittany Johnson, and Kaitlyn Purcell! Daniel Heath Justice is a Colorado-born citizen of the Cherokee Nation/ᏣᎳᎩᎯ ᎠᏰᎵ. He works on Musqueam territory at the University of British Columbia, where he is Professor of First Nations and Indigenous Studies and English and holds the Canada Research Chair in Indigenous Literature and Expressive Culture. A literary scholar, fantasy novelist, and cultural historian, his critical and creative work considers Indigenous kinship, sexuality, speculative fiction, and other-than-human relations. This event has been made possible by the Centre for Teaching and Learning and by the Kule Institute for Advanced Study, University of Alberta. Presented by the Department of English & Film Studies at the University of Alberta. Rumble tells the story of a missing chapter in the history of American music: the Indigenous influence. Registration cost is $150 per day or $350 for the full event. The exhibit runs November 6 to 20, 2017. All are welcome. 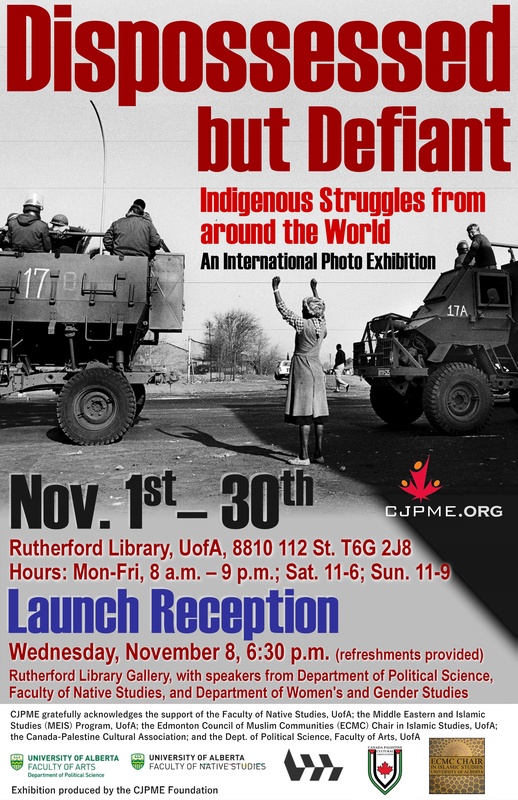 An international photo exhibition with speakers from the Department of Political Science, the Faculty of Native Studies, and the Department of Women's and Gender Studies. The launch reception is Wednesday, November 8, 2017 at 6:30pm at Rutherford Library Gallery, University of Alberta, 8810 - 112 Street. The exhibit runs November 1 to 30, 2017. All are welcome. Using a sweeping narrative focusing on the lives of young students, award-winning investigative journalist Tanya Talaga delves into the history of this small northern city that has come to manifest Canada’s long struggle with human rights violations against Indigenous communities in her uncompromising new book, Seven Fallen Feathers: Racism, Death, and Hard Truths in a Northern City. Tickets are $15. The conference focuses on how to translate the spirit of reconciliation into constitutional text, practice, culture, and law. Organized by the Centre for Constitutional Studies and the Faculties of Law and Native Studies at the University of Alberta, Edmonton. Registration and curriculum information is on the site. Early bird registration of $150 ends on July 15. Exploring Indigenous cultures from all parts of the globe. Métis Kitchen Party: pê-cihkis tamakêk!, Edmonton. This is a free event and all are welcome! Come and celebrate the beginning of the fall term with an evening of music, stories, food, and visiting in a Métis way. Includes a ceremony for the historic Garneau tree at 6pm. Featuring: Marilyn Dumont • Trent Agecoutay • Donita Large • Will Belcourt • Tammy Lamouche • Garry Pruden • Sherryl Sewepegaham • Rory Houle • Billy-Ray Belcourt • Mackenzie Ground • Corinne Riedel • Kaitlyn Purcell • Tarene Thomas • Paige L'Hirondelle PLUS other SPECIAL GUESTS - with MCs Debbie Houle and Richard Van Camp. The National Gathering of Elders will invite 623 First Nation groups of Canada as well as Metis and Inuit groups of Canada. The purpose for an Elder's Gathering is for Elders to come together and take their rightful place as advisors, teachers and leaders. The Host First Nation Community is Tall Cree Tribal Government and the Host Tribal Council is the North Peace Tribal Council. An evening panel discussion with Canadian and international leaders participating in the Nelson Mandela Canadian Dialogues, Edmonton. The Writing Stick: Sharing Indigenous Stories!